The West Indies confront an overwhelming errand when they tackle South Africa in the second Test in Port Elizabeth's St. George's Park on Friday. The visitors were defeated in the first Test in Centurion, where they were beaten by an innings and 220 runs, with the match finishing before lunch on the fourth day. It was such an uneven challenge, to the point that South Africa will again be solid top picks, despite the fact that there are a few elements that support the West Indians in Port Elizabeth, where the pitches normally offer negligible crease development and less pace than other South African venues. It was in the waterfront city seven years prior that the West Indies picked up their just win in 13 Test matches in South Africa. Three of the current squad assumed huge parts, with Shivnarine Chanderpaul (104) and Marlon Samuels (94), the pillars of a solid first innings, while quick bowler Jerome Taylor had match figures of six for 112. On his part, Chanderpaul played down the hugeness of conditions at St. George's Park when he addresses writers on Tuesday. He however, concurred with South African batsman Faf du Plessis that the West Indies had a tendency to blow "hot and chilly" and ascribed the 2007 win to the way that "we had a decent match". "We know we are much superior to we indicated in Centurion," said Chanderpaul, yet he recognized the challenges of tackling what he depicted as "the best bowling assault on the planet". Indeed, Chanderpaul and Samuels will again be enter players in what gives off an impression of being a delicate West Indian batting request. Both will be looking to enhance their exhibitions in Centurion where Samuels made 33 and 17, while Chanderpaul was out for 21 and four. Samuels succumbed to a short conveyance from Morne Morkel in the first innings, while Chanderpaul gloved a horrible bouncer from Dale Steyn in the second innings. 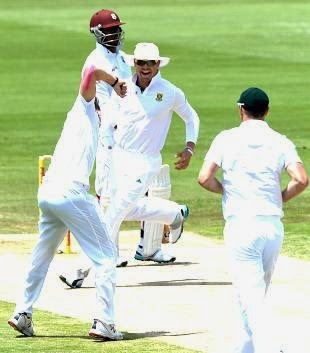 Steyn, who took six for 34 in the second innings in Centurion, has taken 21 wickets in four Tests in Port Elizabeth and said that in spite of the fact that the pitch was slower, he could be successful on the grounds that he was not particularly tall. Not long ago, Steyn had created a match-winning spell of quick switch swing bowling against Australia at St. George's Park. "I'm a bit skiddier so when I bowl a bouncer fellows have a tendency to play a smidgen more though in Centurion gentlemen can escape from the path on account of the bob." South Africa are prone to roll out two improvements to their winning group. Batsman, Temba Bavuma, who is situated to wind up just the sixth dark African to play in a Test match for the nation, set up of harmed wicketkeeper-batsman Quinton de Kock, with AB de Villiers keeping wicket, as he did in both innings at Centurion. Because of the slower surface, South Africa are prone to play a twist bowler, with seamer, Kyle Abbott, presumably sitting out for leg-spinner Imran Tahir. Tahir was drafted into the squad on Tuesday when left-arm spinner, Robin Peterson, endured a damage to his rocking the bowling alley hand.